Writers need to make money with their writing. This means that they need to publish the writing that they do to make money with their writing. Simple? Not exactly. We all love to justify our writing. One way in which we do this is by publishing our writing. Now, for the most part this is not hard to do, we can write online. This will in general make some money. The problem is that this is in general and often, the topic that a writer wants to write about will not justify the writing, and the time, that it takes. So, it is back to the old drawing board. You will have to write a book, or something of that style and then publish it. That is not an easy road to follow, and many a writer can tell you about how hard it is to do. Everyone wants to publish but precious few do. Until you begin to look into the business of self-publishing. This is a place where hundreds if not thousands of people can publish their manuscripts. For a small fee this is possible, but you will need to learn about other things to have success in the self-publishing world. What About Making Money With Your Published Works? No matter which type of publishing you decide you need one thing to continue: Money. 1) Get an editor for your writing. 3) Talk up your books. 5) Make certaint that your book is in both e-book and paperback book. 6) Sell it for a reasonable price. 7) Have a budget for your writing and your book. 8) Stick within that budget. 9) Aim to make a profit with your writing. my views on self-publishing and ont eh company CreateSpace. In this list you'll find teh ten best things about writing and publishing. 1) You need to be able to use your own ISBN. 2) You can use your own templates for your interior and cover art. 3) It needs to be edited-- by a professional editor of your choice. 4) There is no such thing as packages. 5) You need to have your questions answered. These answers need to be clear. 6) You need choice in the prices you set for your books. 7) Distributions options are in your control. Do not be afraid of self-publishing, it is not as bad as you might think it is. In fact if you are publishing your work on the Internet you are self-publishing your writing already. What you need to worry about is money. Not so much what you make in terms of your books, but rather how much money you want to spend in terms of self-publishing your work. This is a hard choice but it is one which you will have to make should you decide to self-publish your books or articles. It is important to understand that it can cost both time and money when you make the choice to self-publish but if you have a niche market this might be the best way to deal with that market, as the sales will not be as profitable for a larger publisher. How we as writers live our lives so that one day we can live our lives-- in terms of money-- with our writing as the primary source of income. All About Self-Publishing-- Which One Would You Choose? One of the main things you need to know is that publishing, or self-publishing, means you have to market your work. This means letting people know you've done something. Some sort of published writing. You need to do this for any published book. You really need to do this for your self-published efforts. Then, you need to keep on writing. Never quit. Have a plan: write a blog before your books come out. Have a following and a link so that people can purchase your book. Make it clear and easy for you to do. Marketing really is about actions. The more you do the more success will come your way. This should be your main focus. That and being a passionate writer. Yes, I can see why starting a blog ahead of time is essential. In fact, in the short time I've been blogging I've seen people do just that. Some even posted excerpts every other day. If you self-publish, no one stops you from doing that. Some really good points as well as links :) Will definitely be check some of them out! Great article. When I looked around the local Book Store I saw something interesting. No really NEW authors. Those that are published tend to be the so-called "Celebrities". Fiction writers tend to be people who have worked in the Mainstream - Media or other establishments. Thus they "toe the party line" and you can never really believe it when they write something that reflects an historical fact. Many Celebrities apparently have "ghost writers" and thus are just a sales front. People on TV tend to disparage Lulu et al as being "merely Vanity Publishers". Publishing to Kindle format is easy but needs a little forethought. Everyone should be able to publish their writing. Many writers say that getting published by a publishing house is the easy part after that comes the hard work of doing the promotions for only "Celebreties" get an advance that means anything. 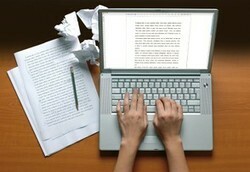 Great guidelines...I need to get into the e-books I've always on writing. darcie-- yes it is a great way to promote your book, and free too! I have self-published with Lulu - but never paid for marketing or promotion. I love writing on places like Squidoo and Wizzley to promote my book. I've just published a lulu book. It's a children's book called Fiona, the Theater Mouse. I haven't started marketing yet, but will start soon. Thanks for giving me a nudge. You know, I am one of those people who actually never felt I had a book in me that just had to get published. But writing is not my first love. I really enjoyed your guidelines. Self-publishing doesn't seem so daunting now. I did look into Lulu once and felt my way around and it seemed doable. Thanks Rebecca.